When we are doing a NodeSchool or a Node.js/Microservices training we usually run into participants who feel lost when they have to use the terminal. Because of this we decided to do a mini blog series of two posts of using the terminal for Node.js development: one dealing with the very basics, and one with more advanced, in-depth tips and tricks. Disclaimer: I'm using the word terminal here because I don't mean a particular shell, but a whole collection of shells. Just to be clear: In computing, a shell is a user interface for access to an operating system's services. The terminal is your universal Swiss Army knife, it will be always with you wherever you go, even if you're working on a remote server or a local machine. The terminal is a computer console, a text output device for system administration messages. Having text input has been always a part of the computer since the beginning of time, but since then we have changed for so called suser-friendly interfaces that are much easier to use. But are you sure that those are more efficient? Having a blinking cursor can be too scary at first for many, but when you get into using it, it will be as simple as any other program. That's not that bad, is it? But this post is not about how fancy it could be, but rather what can you accomplish using it. There are a few tools that if you integrate into your workflow you will definitely become a more productive programmer. Without further due, let's begin! These tools are must have, if you'd like to work with the command line. Read the manual. Man pages are used for documenting CLI applications. Be sure to get familiar with them if you want to dive into using a console interface. You can navigate with the arrow or h, j, k, l keys and quit with q. Searches can be performed starting with a / and after that the search query. Shell knowledge comes handy almost every day; the basic commands are the following, if you'd like to know how to use them try out their man pages. When opening Finder on OSX and clicking through the folders finding a way through them and dragging and dropping is slow. Admit it you feel it every time, there must be a better way. If you know these simple commands and their various switches, you will eventually become more productive. These can speed up file-related operations searching and replacing. With a modern editor that can be easily accomplished but for insane RegEx patterns sometimes its better to pull out grep (or any alternative these days: ack, ag or fzf) and use that. And also that's a nice show-off you can do at the office when pulling off a sweet search and replace by a crazy RegEx command. This is a tool I always use to manage my node processes during development. With nodemon you can start a node process and it keeps it running for. It utilizes fsevents to hook into filesystem changes and it restarts the node process on each file change. You can pass these configurations around if you're working on the project with someone else, and they will have the same project setup without having to fiddle with the env variables. Also make sure you keep nodemon.json in your .gitignore as you may add sensitive information to it. Better be safe than sorry. Gulp is a build tool that is useful if you have to manage a lot of files for a frontend application. It lets you set up a build pipeline and set up a handful of tasks that otherwise you'd have to do manually. Gulp is also available on npm and has quite a few already written plugins for you so you don't have to write all the code yourself. And all these things will be done for you automagically. This one bit right here will compile stylus code to css, minify css, and create sourcemaps for them, and copy them to a dist folder. Having these tasks you can tell gulp what to do with your files, these can be as simple as a copy, but can also be more complex like packaging applications into an artifact. If you'd like to work with Node, you have to get familiar with the concepts behind modular architecture. NPM is a tool that not only makes this possible for us but also makes it easy and frictionless. 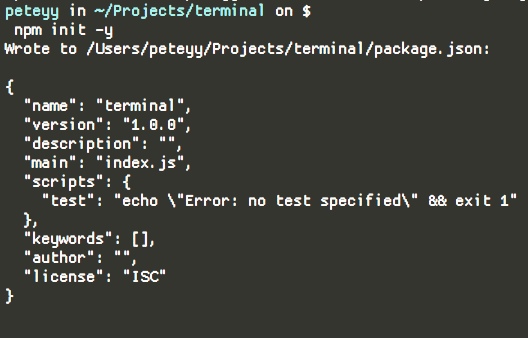 npm init -y sets up a project with defaults, that is pretty useful for test projects or prototyping. "Everything" is just an npm install away. For me --save-dev is way too long, use -D as an alias for --save-dev. These are the most simple tasks that can be accomplished with npm, but this can be taken further by tinkering a bit with the package.json file. There is a script field in the package.json file and with that you can add additional functionalities to your NPM CLI. As seen above you can also chain these scripts together to add even more spice to it. Anything can be passed there as long as they are valid bash scripts. Also what's great about it is that NPM looks for node_modules/.bin for executables when running these scripts - so in the example above neither jshint, nor jscs was installed globally. It will install nvm and put a small snippet into your .bashrc to load it every time you launch a shell. This way it will install all the previously installed packages on the new version as well. .bash_profile or .bashrc is the file that's being read and executed upon creating new bash process when opening a terminal window. You can set up various init scripts and aliases in that file. Having aliases in your .bash_profile will eventually speed up your work process with these tools I've mentioned even more. This will save you a couple of letters when typing. 4 letters instead of 19, once it's not much but when you have to type that every minute while working on a project on the longer run, it's totally worth it. tmux is a terminal multiplexer that allows you to have multiple windows and so-called 'panes' running in one terminal window. During development, I always have several windows open with one or more panes. These consist of a gulp build process for frontend, nodemon for running a server, vim for editing files, mongo-shell for interacting with the database, and I also like to run irssi for connecting to various team chats. You can get tmux from brew or apt-get depending on the operating system. For further reading. But come on, it's a long road to learn all these things, and chances are that you already have a GUI app for these things! At first everything may seem hard and useless but then you start grasping it, you'll create things that would be more time consuming otherwise. All of these things can be composed together to create an exciting, fast and portable workflow that will make daily coding much more enjoyable. You can check my dotfiles on GitHub at peteyy/dotfiles. I would not recommend you to fetch someone else's dotfiles, but find out what you want and how you can do it, and build up your own little domain that's truly yours. Some inspiration on how to start out other than mine can be found at here: https://dotfiles.github.io/. 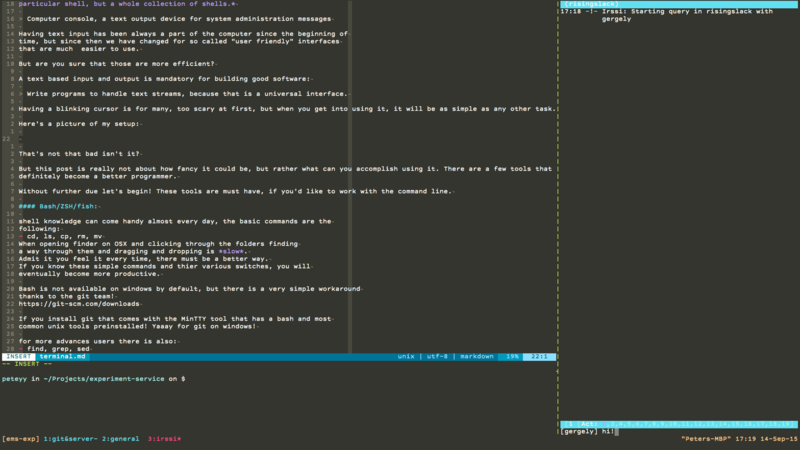 What do you think of this terminal setup? Let me know in the comments below.